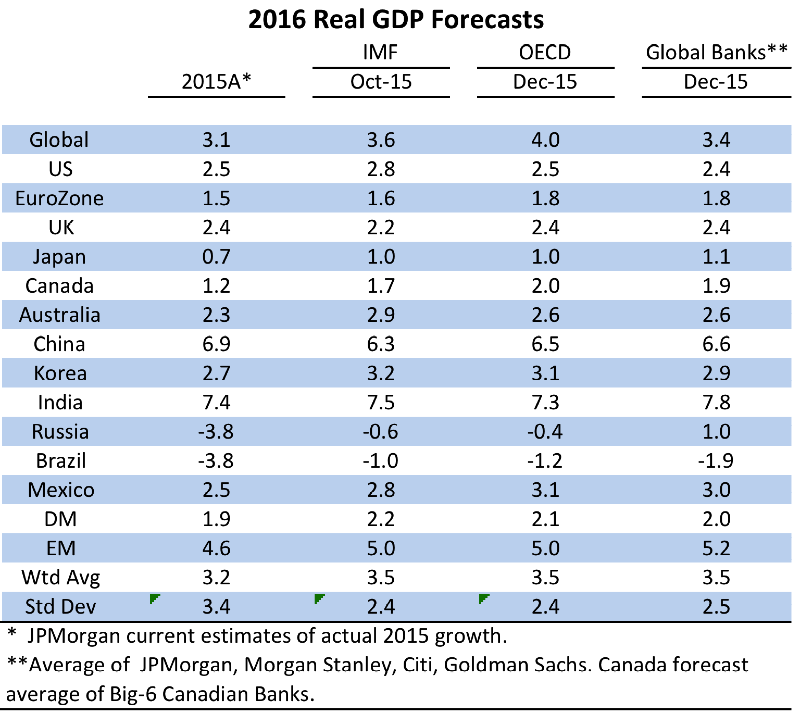 It's now time of year to look ahead to global macro prospects for 2016. I have posted similar outlooks for the past two years (here and here) and followed up at the end of each year with an assessment of those forecasts (here and here). I will state again why I find this exercise useful. I assemble consensus views on global growth, inflation, interest rate and exchange rate outlooks not because I have faith in forecasts. I do it because the consensus view on the year ahead is presumably already built into market prices. The consensus view, as Howard Marks says, is "what 'everyone knows' and is usually unhelpful at best and wrong at worst". What will move markets in 2016 is not the current consensus forecast, but the ways in which actual economic developments diverge from that consensus. In the DM, 10-year government bond yields are expected to rise in all of the economies we track except Australia; In the EM, yields are expected to rise modestly in China, Korea and Mexico, but to fall in India, Russia and Brazil. After strengthening against all the currencies we track in 2015, the US dollar is expected to turn in a more mixed performance. USD is expected to strengthen further against EUR, AUD, CNY, KRW, INR and BRL. However, by the end of 2016, the USD is expected to be weaker against JPY, GBP, CAD, and RUB. After poor performances in 2015, equity strategists tell us that US and Canadian stock markets are expected to post gains of about 5.5% and 10%, respectively. If these consensus forecasts sound familiar, thats because they are very similar to forecasts made at the end of 2013 and the end of 2014. Each year, global growth was expected to pick up, global inflation was expected to move higher, the Fed was expected to lead global tightening, bond yields were expected to rise and North American stocks were expected to rally. Both 2014 and 2015 witnessed big macro forecast misses by the consensus. These misses were characterized by weaker than expected global real GDP growth and inflation, lower than expected bond yields, greater than expected USD strength and weaker than expected stock price gains. Are we being set up for similar forecast misses in 2016 or will this be the year when the consensus is correct and things turn around? Last year at this time, global growth was expected by the IMF to pick up to 3.8% in 2015 while global commercial bank economists expected a more modest acceleration to 3.4%. Instead, 2015 global growth is now estimated to have slowed to 3.1%. This year, forecasters tell us once again that global growth will pick up in 2016 to 3.6% (IMF October forecast), or to 4.0% (OECD December forecast), or to 3.4% (average of global commercial bank forecasts). 2016 real GDP growth is expected to be stronger almost everywhere, but with the notable exceptions of the US and China. Economies with the largest consensus forecast growth pickup include Canada (1.9% in 2016 vs 1.2% in 2015), Mexico (3.0% vs 2.5%), Japan (1.1% vs 0.7%), India (7.8% vs 7.4%), Australia (2.6% vs 2.3%), and Eurozone (1.8% vs 1.5%). While global growth is expected to be a bit stronger in 2016, the divergence between DM and EM growth performance is expected to continue. EM growth is consistently higher than DM growth, but the important divergence is that, for a third consecutive year, DM economies are expected to grow at or above their trend (or potential) rate of growth, while most EM economies are expected to grow below their trend rate. In the chart below, the blue bars show the 2016 consensus growth forecast versus the OECD estimate of the trend growth rate for each economy. In 2016, the larger DM economies are expected to grow at an above trend pace, while Canada and Australia and are expected to grow at trend. In contrast, three of the larger EM economies are expected to grow well below trend: Brazil (3.4% below trend), Russia (1.5% below trend) and China (0.4% below trend). 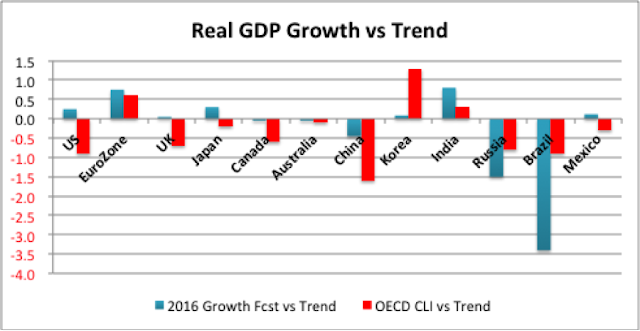 In the chart above, the red bars show the latest OECD composite leading indicators (CLIs) versus trend for each of the economies. As was the case a year ago, these CLIs generally support weaker 2016 growth than economists are forecasting, with a few exceptions. In the DM economies, the leading indicators suggest that growth could surprise on the downside, especially in US, UK, Japan and Canada. In the EM economies, CLIs suggest that growth could be weaker than expected in China, India and Mexico, but stronger than expected, although still below trend, in Brazil and Russia. Global inflation has consistently fallen short of expectations since 2013. This has occurred in spite of unprecedented efforts by central banks to fight disinflation. A year ago, global inflation for the entire set of world economies was expected by the IMF to edge up to 3.8% by the end of 2015 from 3.7% at the end of 2014. By October 2015, the IMF had cut its year-end 2015 global inflation forecast to 3.5%. Meanwhile, a year ago, global commercial bank economists expected weighted average inflation for 12 major economies we track to move up to 2.8% in 4Q15 from 2.1% in 4Q14. These same economists now expect that weighted average inflation for these countries fell to 2.0% in 4Q15. For 2016, the global commercial bank economists forecast that weighted average inflation for the 12 countries will rise to 2.3% in 4Q16. The OECD expects an even bigger acceleration fore the 12 countries to 2.5%. These forecasts, many of them made between early October and early-December, may already subject to downward revision. Crude oil prices ranged from $43 to $51 per barrel during the period these forecasts were made with expectations that prices would firm further heading into 2016. Instead, in the wake of the December OPEC meeting, the price has fallen to $36/bbl in late December and looks likely to remain depressed for a considerable period of time. In most countries, inflation can be expected to remain weak. Considerable slack remains in the global economy, especially in EM economies. Wage growth remains subdued. Commodity prices are likely to remain weak. Inflation expectations are stable and soft. Some economists, who are not part of the consensus, have a much darker view of 2016 prospects. One such economist is David Levy, of the Jerome Levy Forecasting Centre, which has a long and enviable forecasting track record. Levy: [T]here is no way the U.S. by itself is about to keel over. The danger is not so much that we’re going to start to slide sharply, but rather that conditions overseas will become much rockier. Barrons: Which could pull the U.S. into a recession? Levy: Yes, and there are several reasons why. Such a scenario has never happened, certainly not in modern history. There is no postwar recession prior to which the U.S. economy was doing fine, only to get knocked down by the rest of the world. That’s one reason people don’t see the risk. But the emerging markets are not just going into a recession, they are going through a secular adjustment. .... We expect not only a global recession, but also general asset deflation, aggravated by the fact that there is no room to cut interest rates at the major central banks.... Bit by bit, the global economy is falling into recession, with the U.S. bringing up the rear. ...We expect that the Fed will reverse course later next year. In all probability, the slowly spreading global recession will intensify and ultimately engulf the entire planet. It’s at least 2 to 1 that we’ll be in a recession at the end of 2016. Levy is not alone in warning that 2016 could fall well short of consensus forecasts. Albert Edwards at SocGen, Niall Ferguson of Harvard, Russell Napier, and Lakshman Achuthan of ECRI are also warning of the likelihood of weaker growth or recession. I'm not suggesting that we should toss the consensus forecast in the trash and use Levy's quite plausible forecast as a base case. But I am suggesting that we should apply a hefty discount rate to the consensus and consider the risks around the benign outcome that reflects "what everybody knows". 2015 turned out to be a third consecutive year in which global growth was modestly disappointing, but the real story for markets was the divergences in real GDP growth. Will the divergences of 2014-15 continue? If so, the US Fed will likely be joined by the Bank of England and perhaps a few other central banks in tightening monetary policy in 2016, while the ECB, BoJ and PBoC will likely maintain their current accommodative policies or ease further. In this scenario, the US$ is likely to continue to appreciate against currencies of countries whose central banks remain accommodative. Further appreciation of the US dollar combined with below trend growth in China, Brazil and Russia will, barring a major geopolitical event, wii likely continue to weigh on commodity prices and the currencies of commodity exporting countries. Can the macro divergences between above-trend growth in some key DM economies and below-trend growth in key EM economies be sustained without serious financial instability in some countries and significant volatility in global currency and financial markets? Can commodity prices stabilize and recover even as the USD continues to rally and global commodity supply continues to outpace global demand. Can China and other EM economies prevent hard landings for their over-leveraged economies? Can Canada and Australia, with overheated housing markets, rebound to grow at or above trend after a sharp fall in commodity prices and as the Fed continues to raise its policy rate? Will we look back on 2016 as yet another year that started with optimistic forecasts and ended with disappointment? A year ago, my answers to these questions were: No, No, Don't Know, Unlikely, and Probably. I can see little reason to change these answers as we head into 2016. In the near future, I will turn to the question of how Canadian investors should think about 2016 as another year with macro risks skewed to the downside.